In order to have a boat on the Thames one needs a licence and in order to obtain the licence one needs a boat safety certificate. I have now had the inspector come out to take a look and generally everything is up to standard. However in order to fully comply and gain the certificate I need to rearrange or replace the fuel tank so the it can be filled externally to the boat. 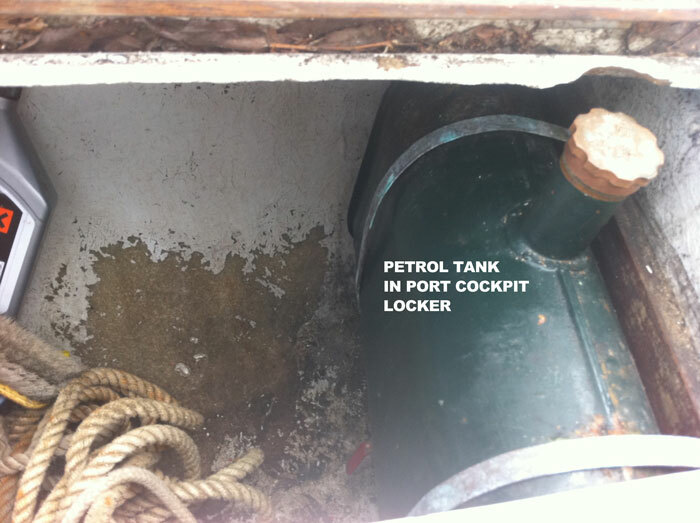 Currently it is in the port cockpit locker so there is a risk petrol could spill into the hull when filing which is a big no-no. In the scheme of things reconfiguring it shouldn’t be to arduous, but after this week the examiner won’t be around for a month to sign off and without the certificate and licence I am not officially allowed to use the boat and will not be able to get past the lock keepers. The solution he suggested is to decommission the engine by removing the fuel tank, electrics and carburettor and then use an outboard in the meantime. This is a bit of a relief as it has had a domino effect forcing my hand on a few issues I have been debating. Having the internal engine is great, but it’s just not reliable enough yet to provide the freedom of just being able to jump in the boat and head off at on a whim. As such I had been considering getting and outboard anyway and have now picked up a little Marina 7.5 on eBay. The second issue was the boat’s name. For some reason I just don’t like it and have a much better one in mind which I feel is more apt. 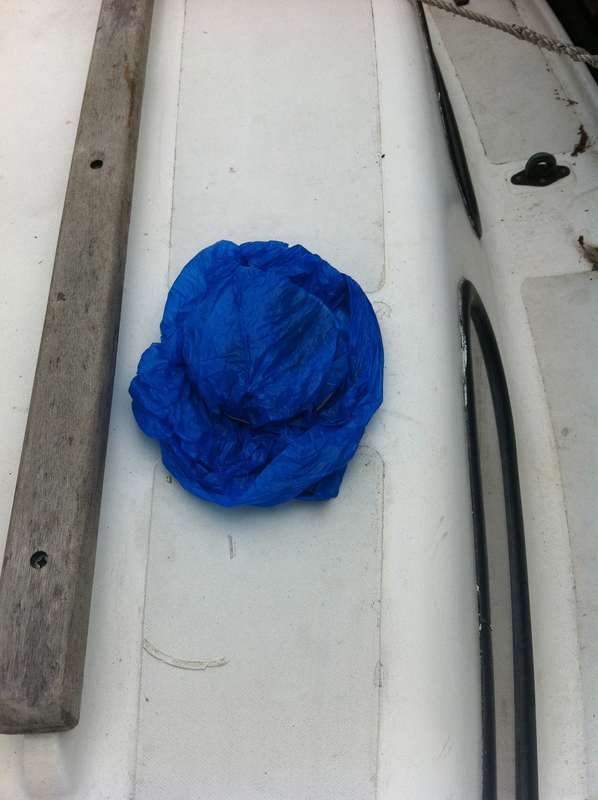 However, I have been slightly wary of the superstitions of changing a boat’s name and intend to do it with the requisite ceremonies which require pouring away a lot of champagne which I am not so happy about! This is also the reason I have never mentioned the current name here. Old superstitions do not allow for the Internet where nothing can be deleted permanently. 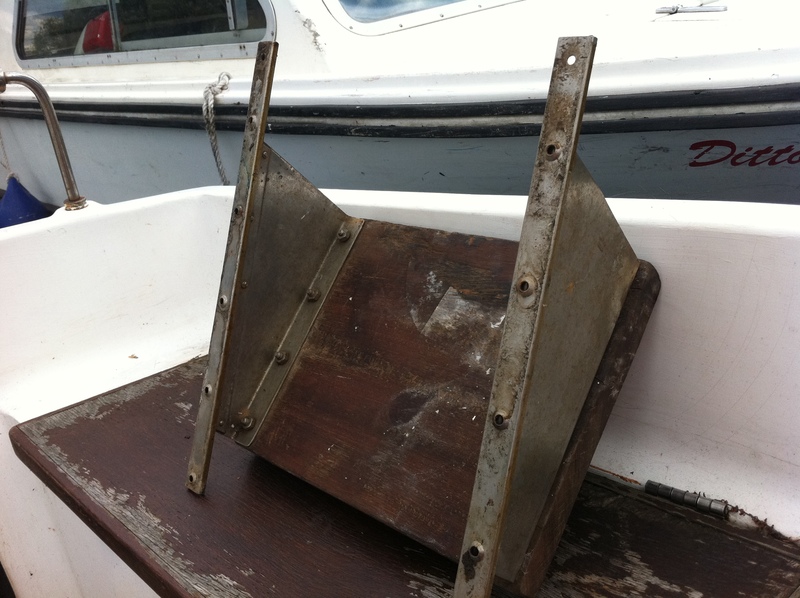 Anyway, having got the outboard I was waiting to spot a reasonably priced bracket, but then poking around in one of the lockers I found the original with its attachements! I really have a massive appreciation for the previous owners who in addition to keeping all the original parts also documented every penny spent over the last 30 years with receipts and brochures. 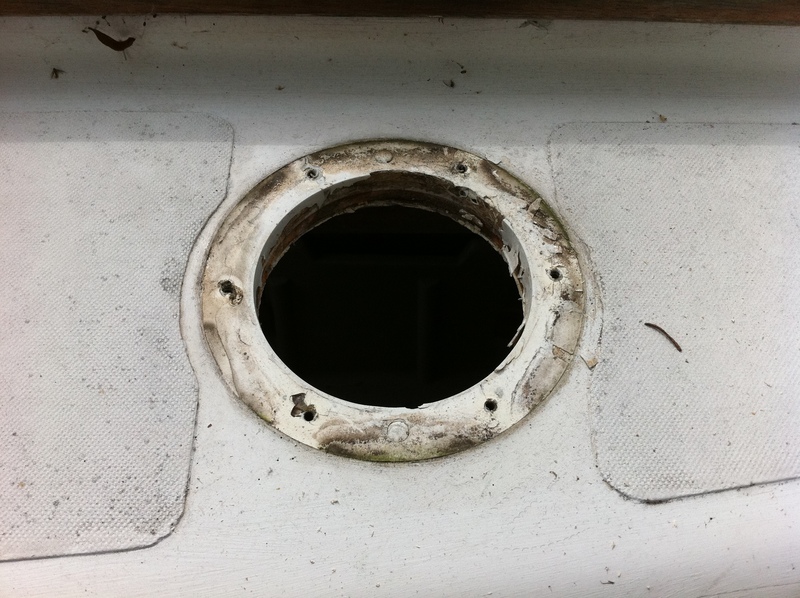 However, the bracket fits to the transom exactly where the current name is displayed. As such, I will need to remove it and so have the perfect excuse for a renaming ceremony. The timing will also work well as I can get my certificate and licence with the new name and effectively start afresh. After advice from friends and forums it was time to head back and give everything a go. So armed with a new spark plug, a tin of 3-in-1 and a can of gypsy breath (easy start) I headed over to the boat yard to try getting the engine going again. First off was a good glug of oil straight into the cylinder in case the seals had shrunk. After giving it a few cranks to give everything a nice coating I fitted the new spark plug. Then it was back to cranking away. There was definitely some improvement. It was a lot easier and after a while a nice “shhh-ti-cop” noise began to come from the carb with each turn but it still wasn’t firing. Next I tried adding a couple of drops of fuel straight into the cylinder. After a few cranks there was a spark of life and the fly wheel turned a couple of times before dying. Enthused I tried again but nothing. Then took the spark plug out, dried it and replaced it. A few cranks and bingo. Another brief sign of life. I repeated the cycle a number of times, then the yard owner had a go. Strangely, the old spark plug seemed to work better. By now where getting three spins. Scratching our heads we checked everything to find the exhaust valve was not open. Remedying this and there was a cough a splutter and then a shuddering build up as the engine kicked into life. Once up an running and it seemed hard to conceive of a more satisfying sound! Since this time there have been a few breakdowns due to a variety of faults including the need to clean the carburettor and not having enough fuel in the tank. 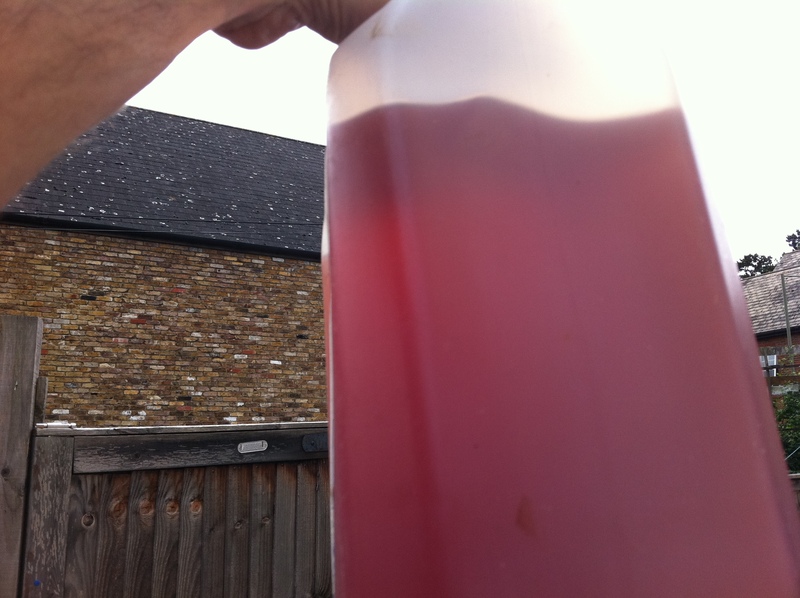 It was by no means empty, but being gravity fed needs the tank to be more than half-full to operate properly. Well this was always going to be a big project. The sales literature suggested the engine had been running last year. However, I found an old log entry which suggested that it had last been used in October 2009 when it had broken down passing the London Eye on the way up from Essex. As such, my hopes of a quick and easy fix were not high. The P5 has a crank start and has a little brass carburettor that need to be ‘tickled’ to fill it by pressing the pin on top up and down until the bowl fills and it floats. On Wednesday evening myself and a friend who knows about motors headed over to see what state she was in. The good news was that the engine would at least turnover and amazingly the batteries still had a decent 12v charge. The compression was a passable 50, the plug had a spark and with a little ‘tickle’ the carb filled. Enthused, we began cranking away but to no avail. Next we decided to change the fuel. Unfortunately there was a nearly full tank of at least 10 litres. 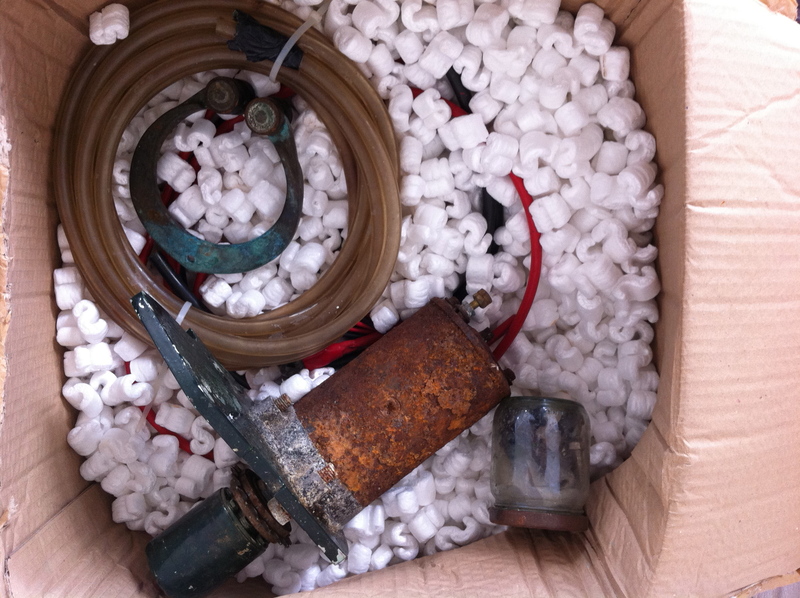 Luckily we were able to find an old petrol can knocking about and a five litre container. Draining from the bottom proved far too slow so we had to disconnect the whole tank and pour it out through a funnel. A good thing we did. What came out smelled like varnish and was a deep red colour and would probably put a fire out. After flushing the fresh fuel through and adding some oil it was time to start cranking again. This was exhausting work. The engine seems to have an odd system whereby the crank will turn freely for a random number of turns before finally engaging with the flywheel to turn the engine over. As a result, it can often catch one unawares thereby missing the chance to give it a really hard spin when the right moment comes. Despite checking the timing of the spark was okay (it was) and trying to get it going for another hour we had no luck. Not even a pop, and come nine o’clock when it started getting dark it was time to call it a day. This was not a very satisfying experience, but at least we had covered most of the basics and it was turning a bit easier when it engaged. Well, today I handed over my cash and took official ownership of my Vivacity 20. 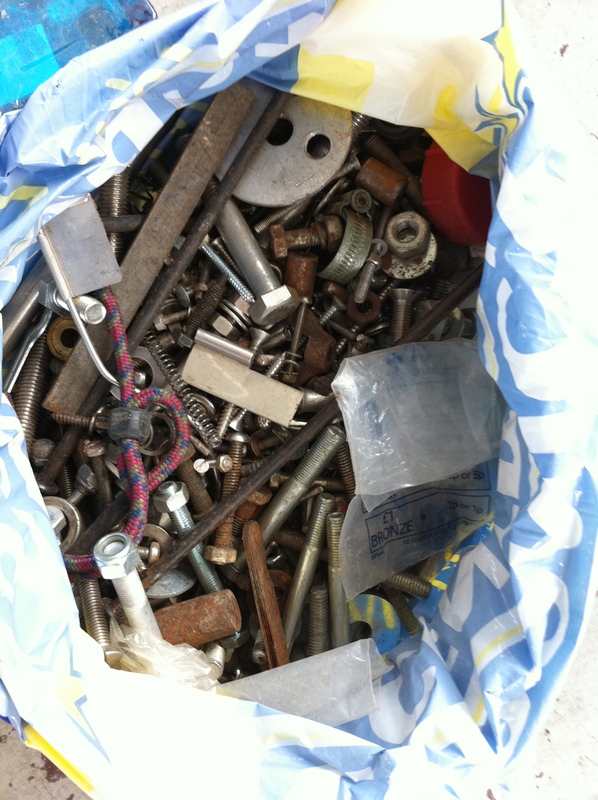 Along with the keys came a big bag of nuts, bolts and goodness know what else plus another big box of gubbins, which is a bit worrying. The owner before last had spent £14.67 posting them down to the previous one where they had sat unopened until now. I am hoping that they are just spares and if anyone can identify them, please let me know! I had thought the first project was going to be getting the engine going, but this morning my new air vents arrived so I was keen to get them fitted and make my mark. The existing ones were cheap plastic mushroom vents that had been broken and were letting in the rain. When I had first viewed her I covered them with plastic bags, but these don’t exactly provide the look I am aiming for. 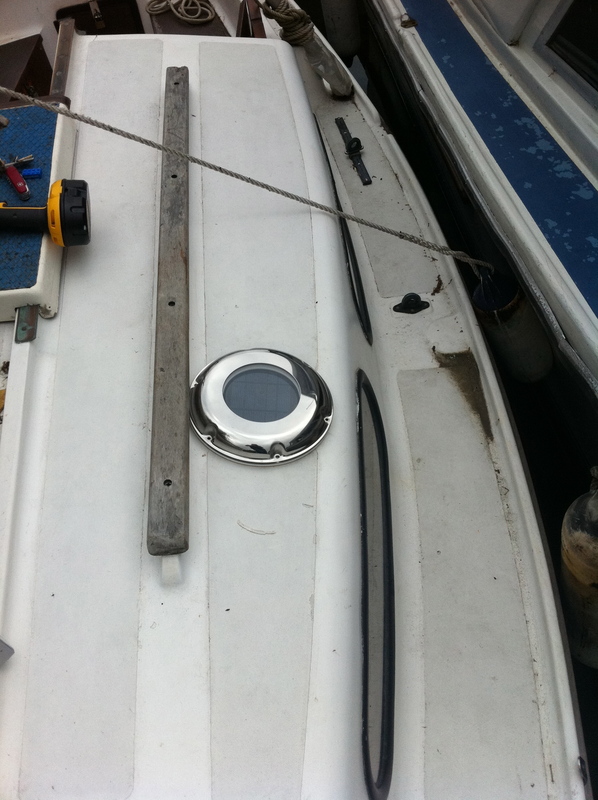 In the first rush of excitement in owning my own boat I decided to splash out and invest in some solar powered vents. I found mixed reviews about these online, but I am unlikely to ever go fast enough to get a strong natural draft through and ‘her on shore’ will be fussy about sleeping onboard if its too mildewy. Anyway, I decided to go for the Smart Solar 300s which I was able to find at a good price and will update if there are problems down the line. Fitting was surprisingly easy. The old moldings came out smoothly once unscrewed and then having routed out the hard sealant the new ones slipped in like a glove. It was then that I noticed that they were not supplied with screws, which is a bit of an annoyance. They are also a tad too large in my opinion, but overall I was pleased with the effect and the fans started working immediately. Smart Solar 300 vents in place. Calculating costs for river boating on the Thames. This year I am planning to just use the boat for a few overnight trips up the river with the kids. In fact, she may never see salt water again whilst I own her, perhaps not even a tide! Now having bought her on eBay I am starting to add up the costs of ownership. 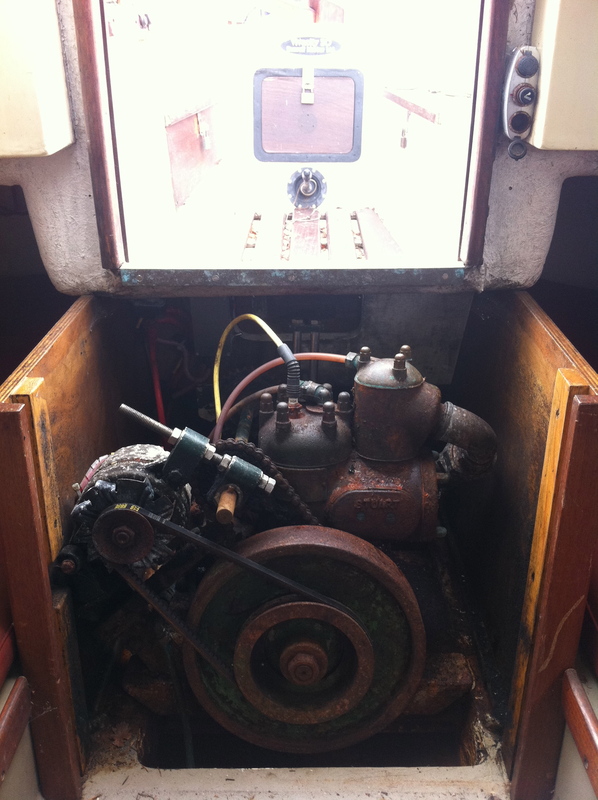 Getting the inboard Stuart Turner engine running again: Awaiting quote. I have a feeling I will be adding more to this list pretty soon! !